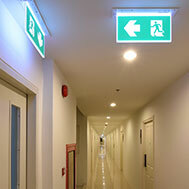 Emergency lighting is an essential part of the health and safety provision for any building. The purpose of emergency lighting is to provide immediate secondary lighting when there is a mains failure, this ensures that occupants can exit the building safely. – EMERGENCY ESCAPE LIGHTING: Provides illumination to enable a safe exit from a location in the event of a mains failure. – EMERGENCY ESCAPE ROUTE LIGHTING: Ensures adequate visual conditions and direction on escape routes so that occupants can exit from a location safely. Additionally, this allows all fire fighting and safety equipment to be easily located. – OPEN AREA (ANTI- PANIC): Allows sufficient illumination to reduce the likelihood of panic and to enable safe movement of occupants towards escape routes by providing appropriate visual conditions and direction finding. – HIGH RISK LIGHTING: The objective of high risk task area lighting is to contribute to the safety of people involved in a potentially dangerous processes or situations and to enable proper shut down procedures to be implemented. – STAY PUT EMERGENCY LIGHTING: Provides illumination for occupants to stay in the premises if the normal mains lighting falls. In a non-emergency situation with no risk, such as general mains power failure or interruption of the local lighting supply. Maintained emergency luminaires are designed to be illuminated at all times, as well as during a power cut. Whilst they typically operate utilising power from the mains supply, when the battery mode is triggered they source power from the backup battery. Non-maintained emergency luminaires only come on when the electrical power supply fails, they are produced solely for emergency use. This type of emergency fitting is designed to ensure all exit routes are lit, however, these will not be active and used as normal day-to-day lighting system. Steon Lighting offer a comprehensive range of integral and dedicated emergency luminaires to aid compliance with these guidelines. These luminaires are available with maintained and non-maintained options, and can incorporate self-test and DALI functions. Our full range can be found here. If you have any ongoing projects which require emergency lighting please contact us.